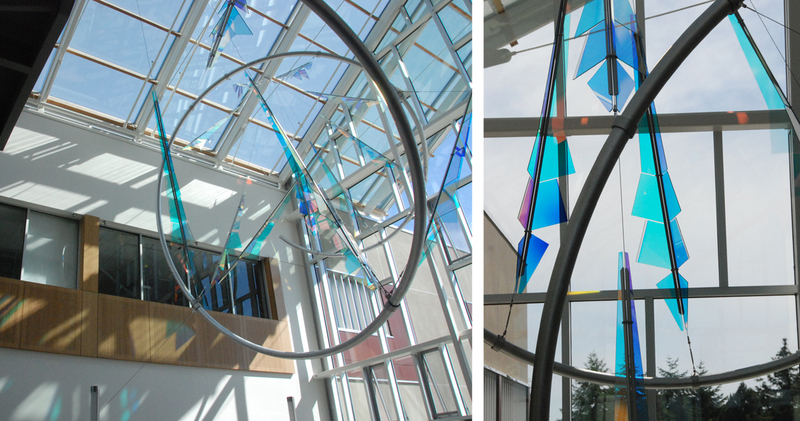 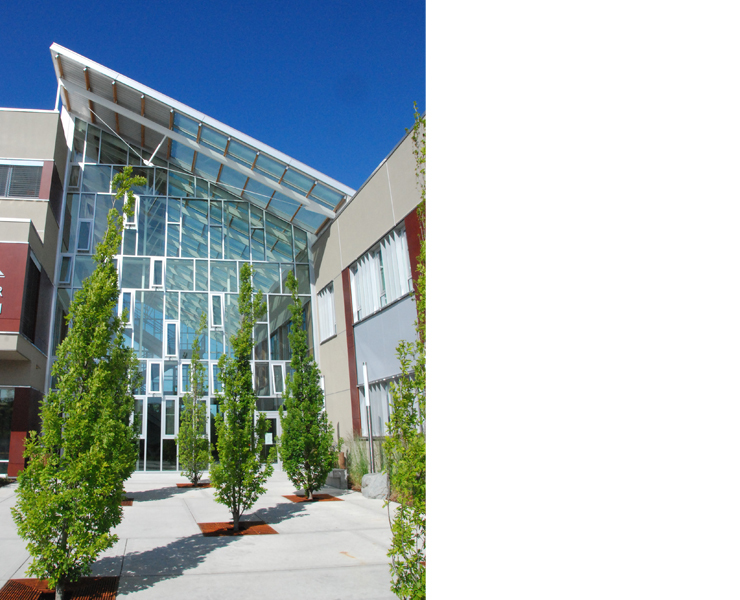 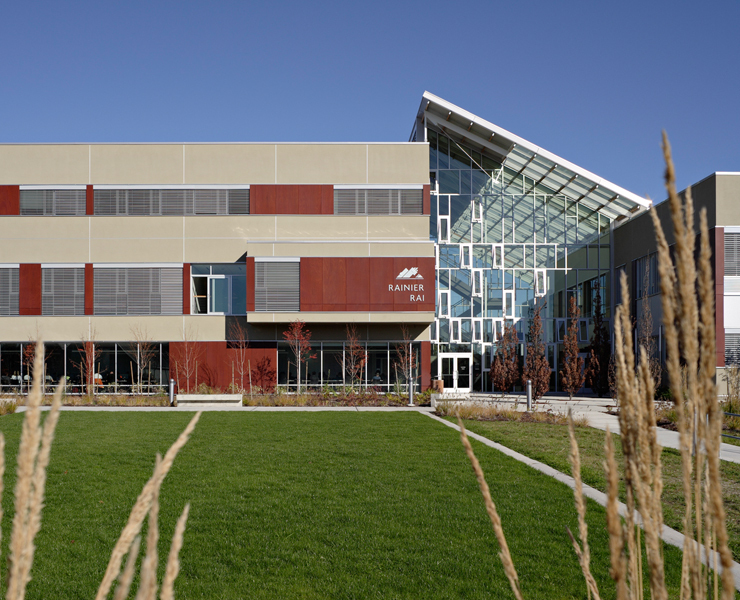 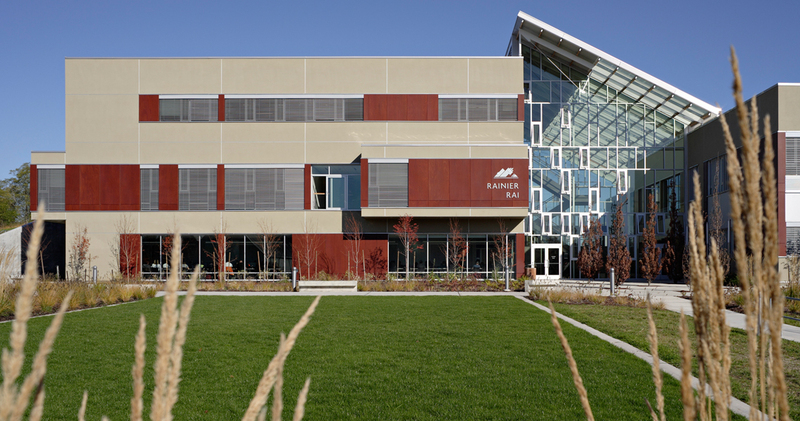 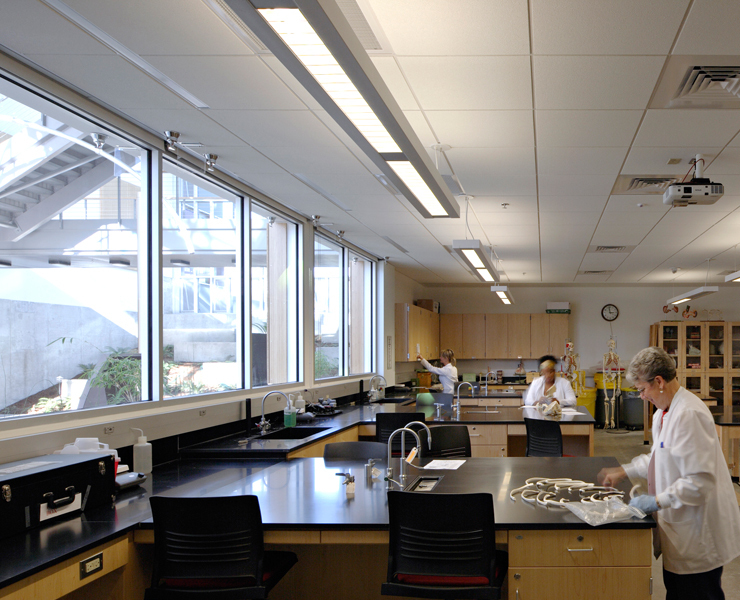 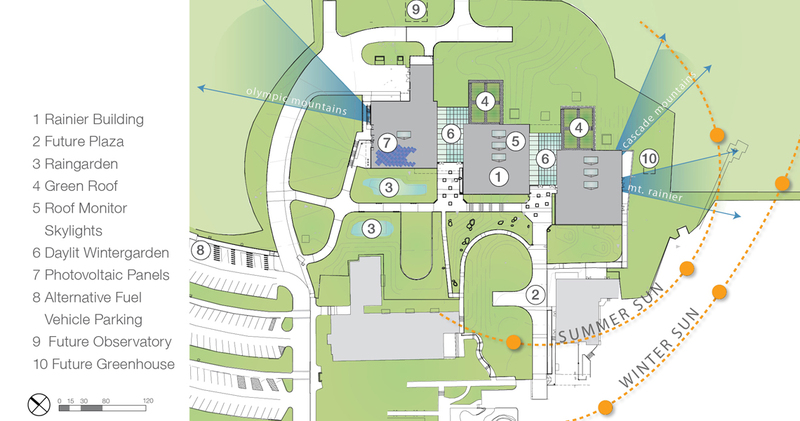 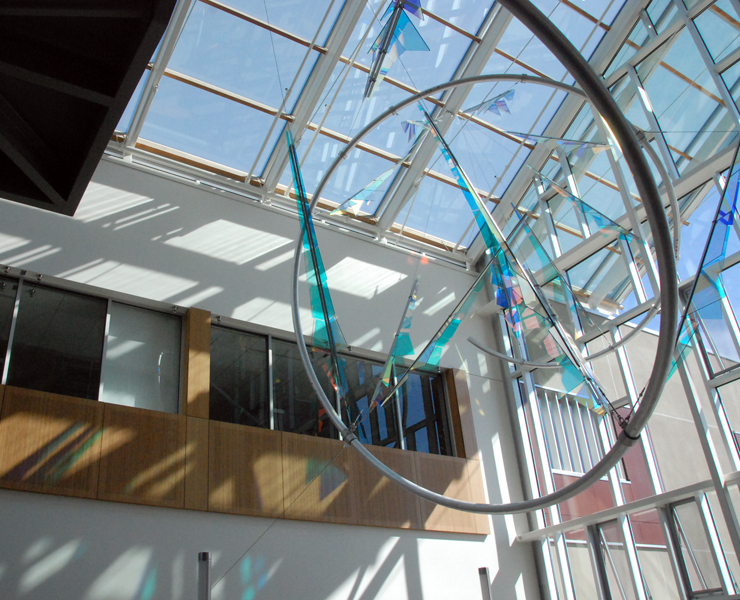 The Rainier Science and Technology Building was developed from the beginning of programming as an interactive and dynamic facility where the building becomes an integral part of the curriculum and learning pedagogy. 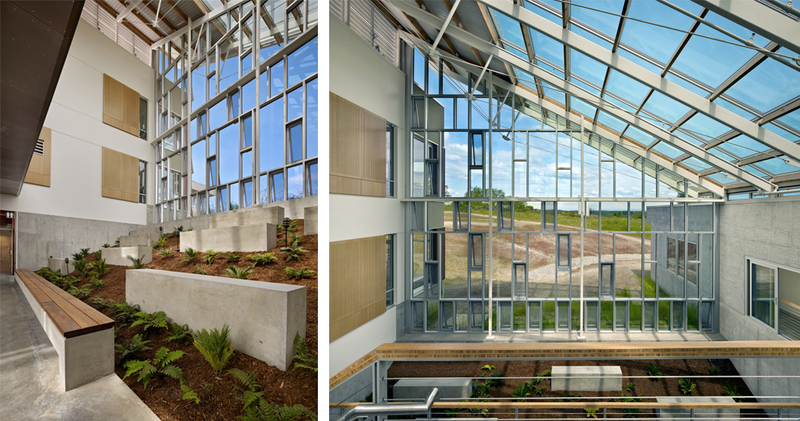 This facility demonstrates how an integrated sustainable design approach can create real cost effective innovations that enhance learning. 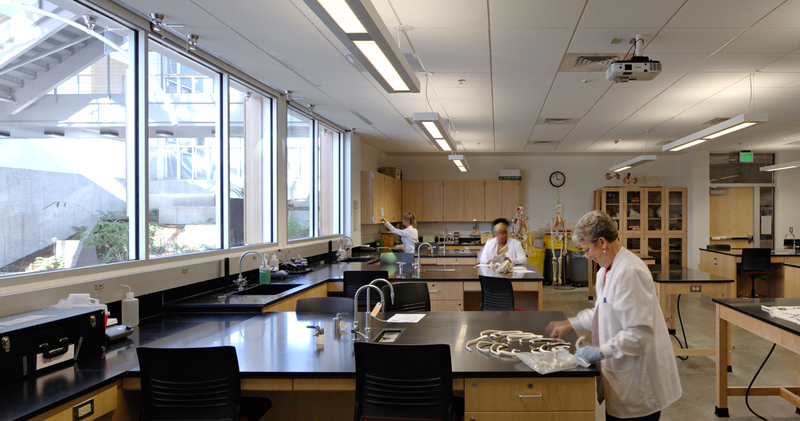 The 70,000 sf facility houses Biological Sciences, Chemistry, Earth Science, Physics, Mathematics and Engineering. 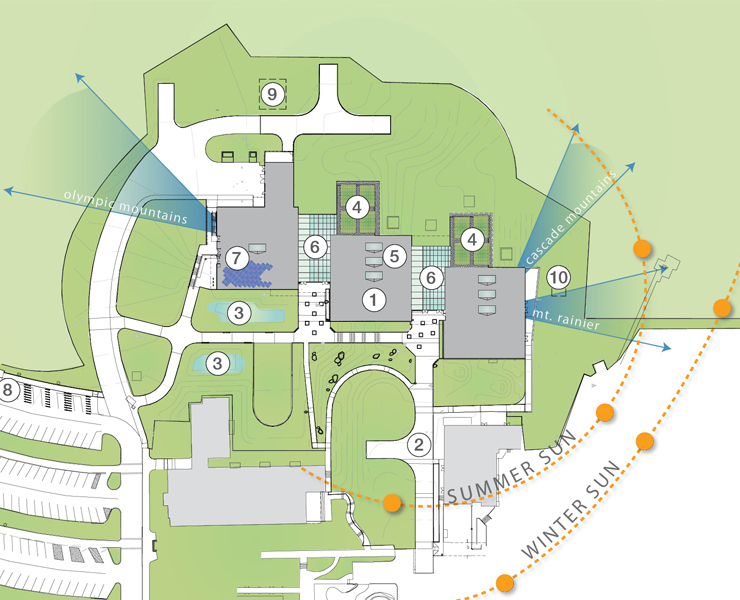 In addition, the building will contain a new Observatory and Planetarium, classrooms, dry and wet labs, and interactive exhibits. 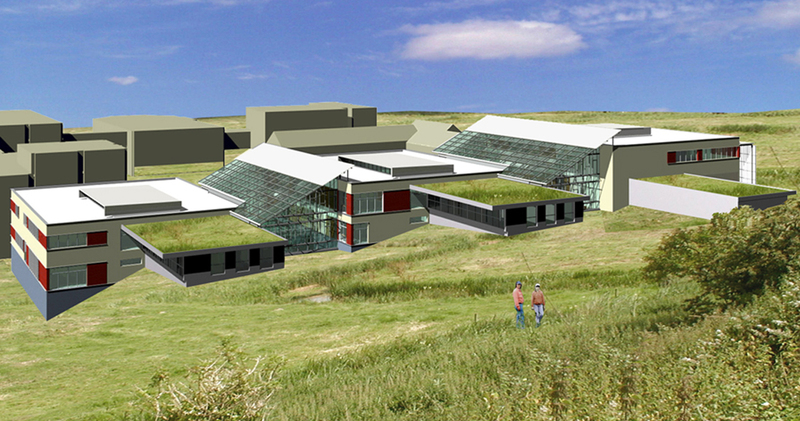 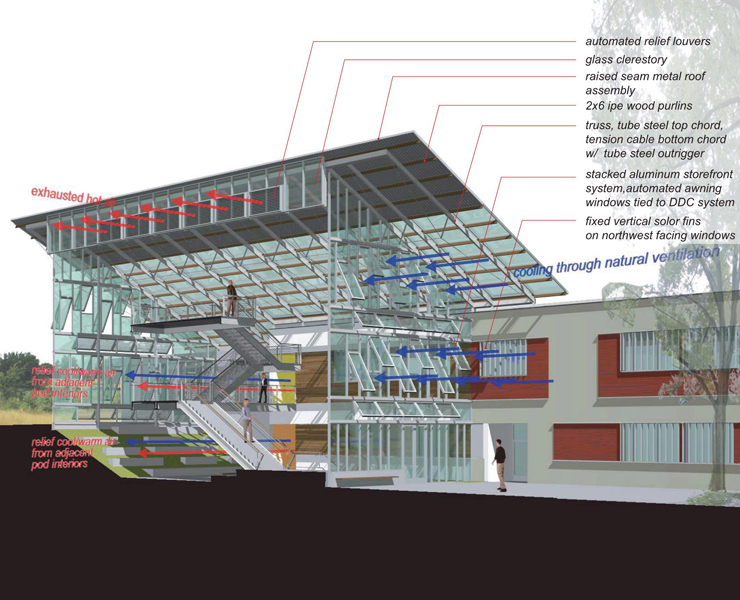 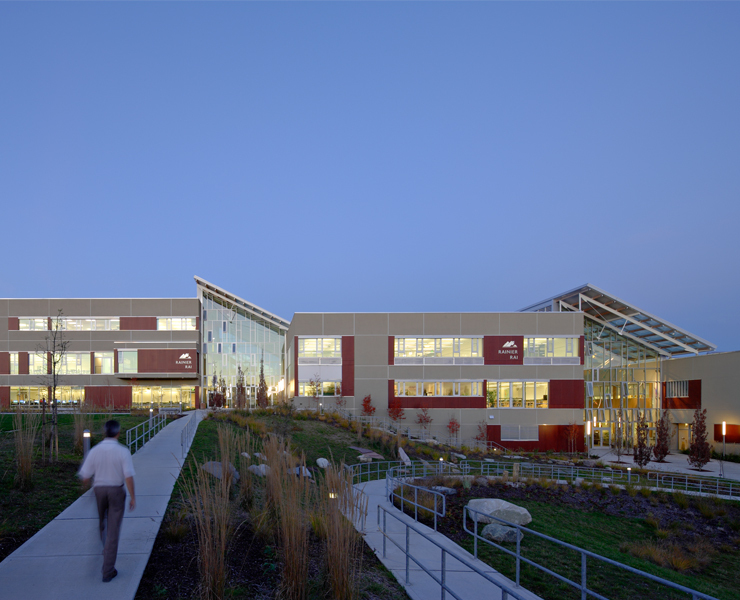 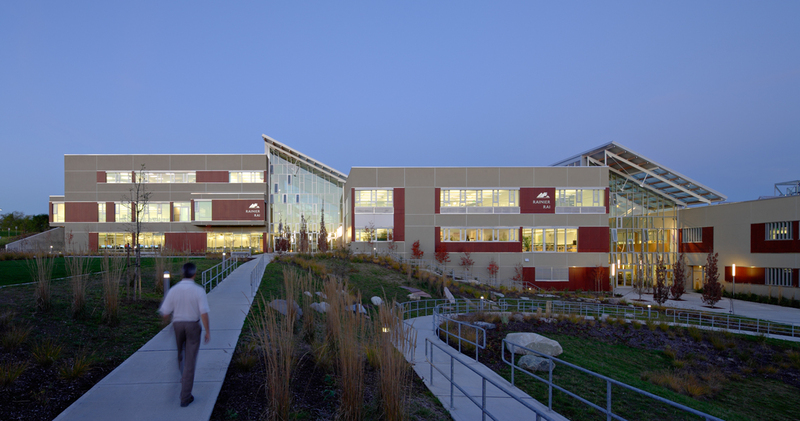 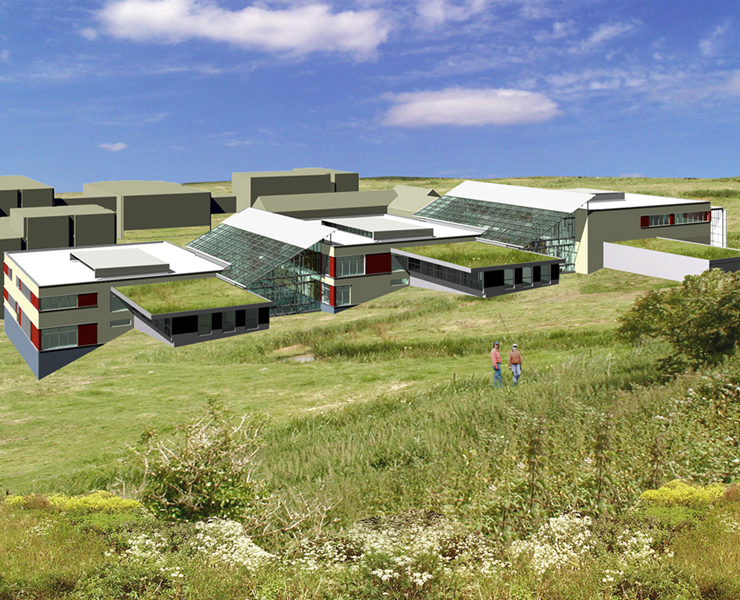 Primary project goals included sustainability and connecting the building directly to the programs it houses, while integrating into the landscape. 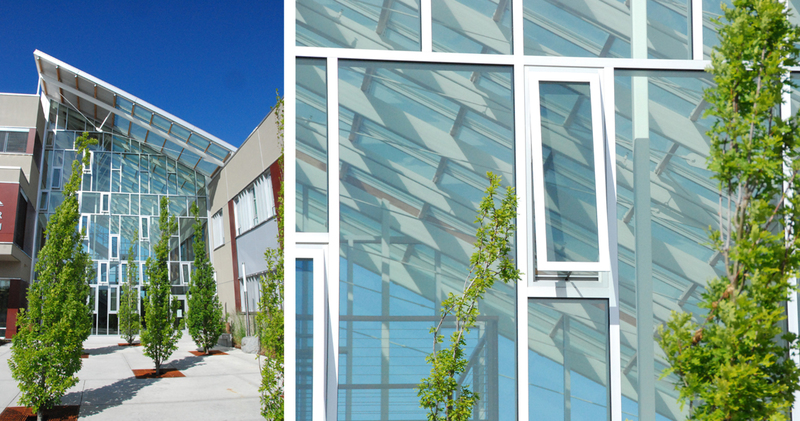 Certified LEED Gold, the new building is sited to take advantage of sun angles and wind direction, daylighting, natural ventilation, solar energy, photovoltaic and water harvesting technologies. 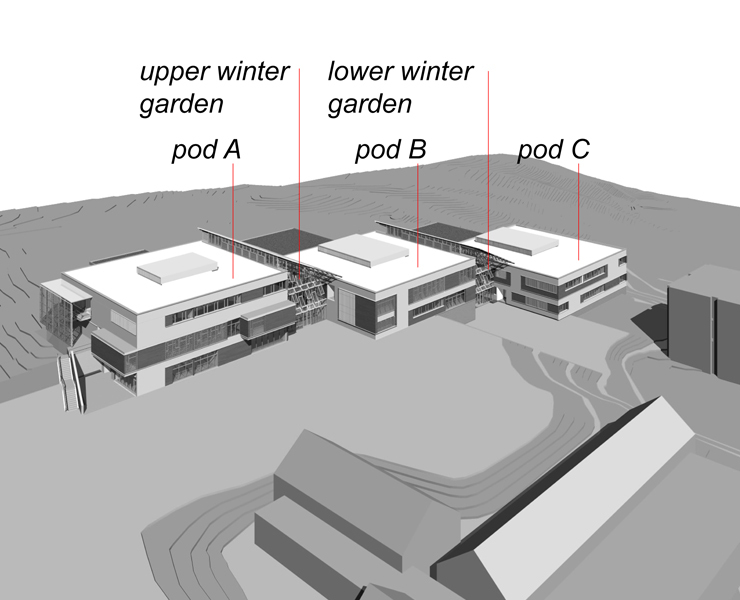 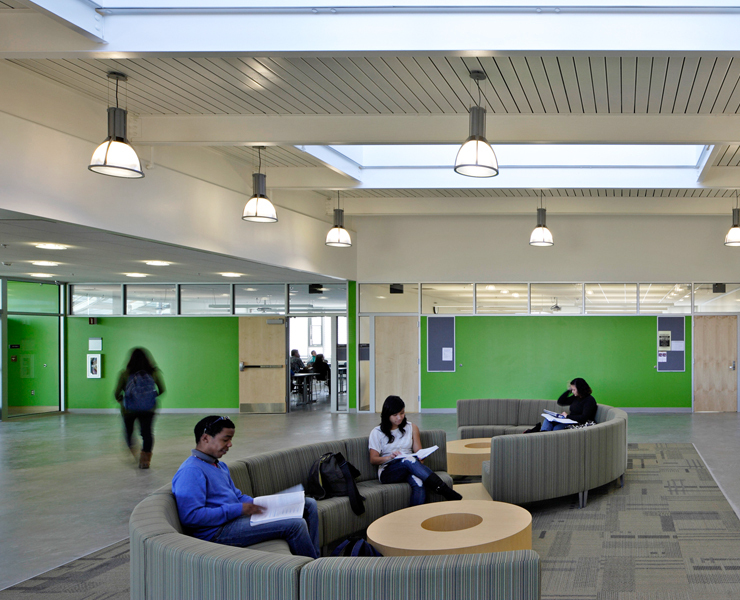 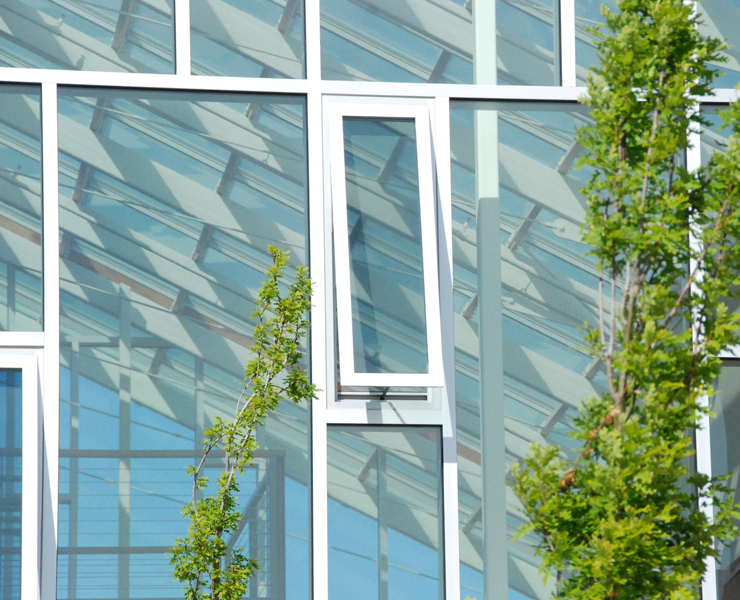 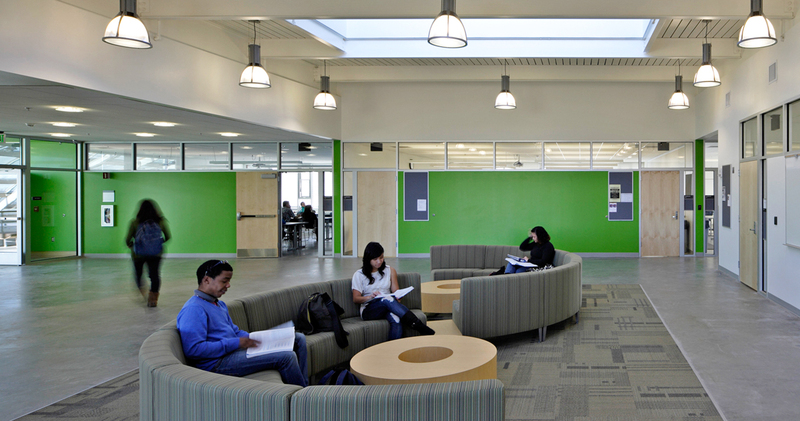 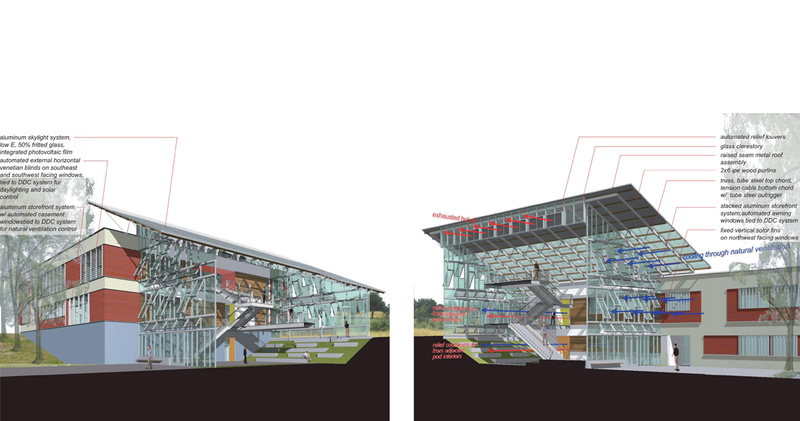 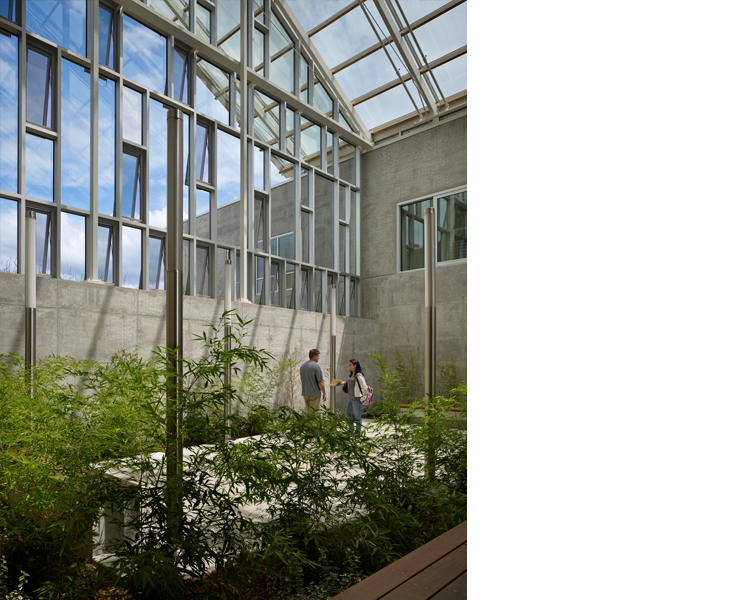 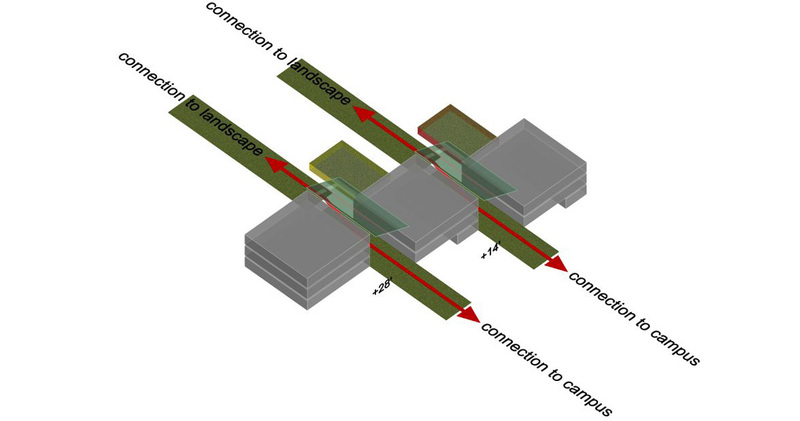 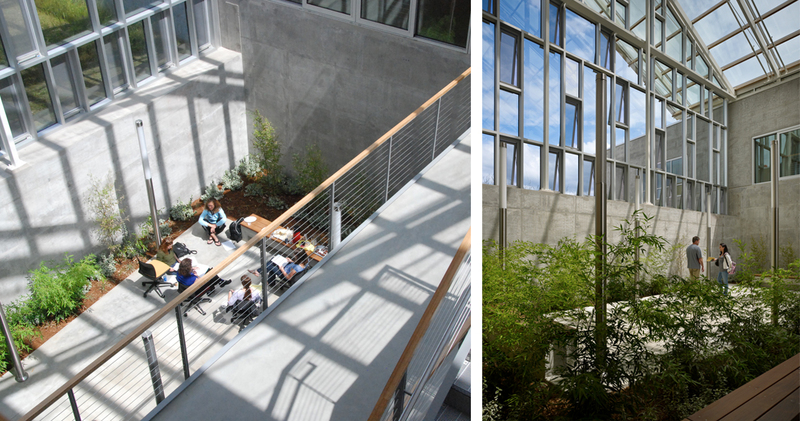 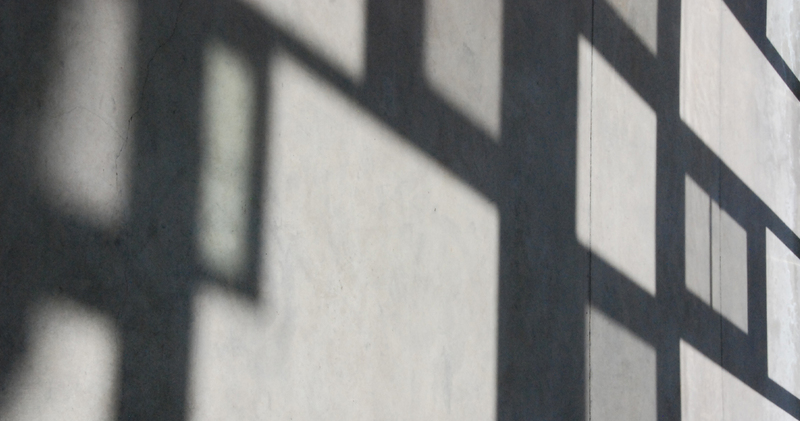 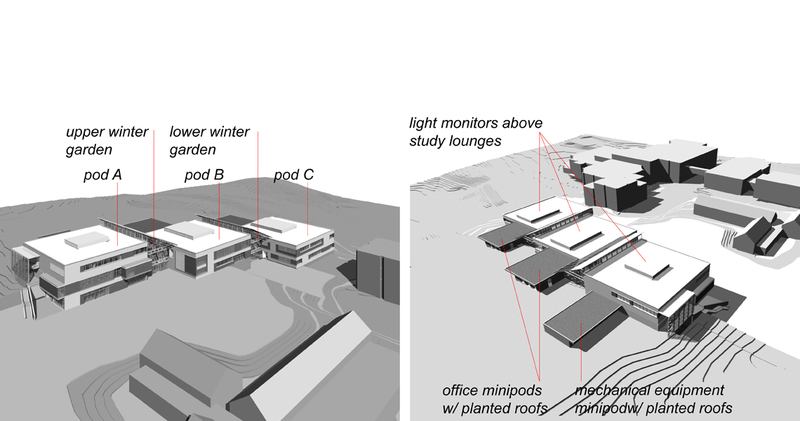 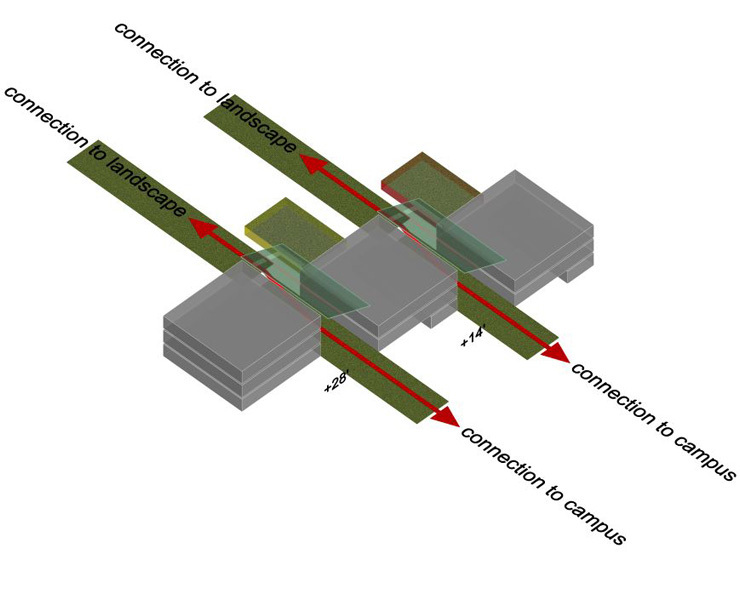 The building was divided into three learning community pods separated by two unique winter gardens that provide valuable informal learning spaces for the campus, while bringing daylight and natural ventilation deep into the building. 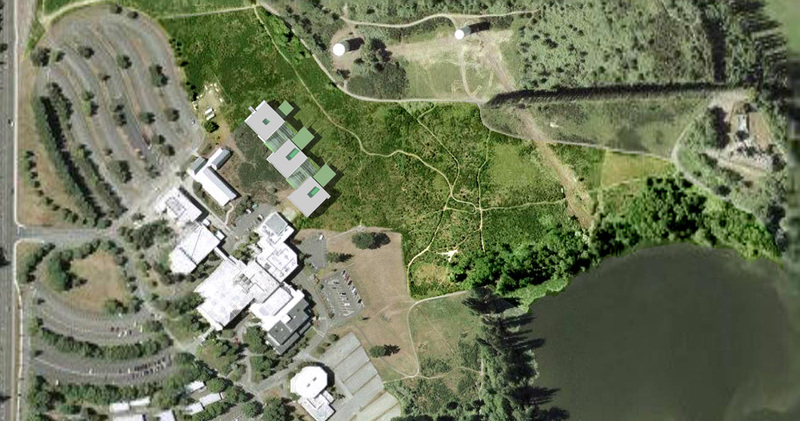 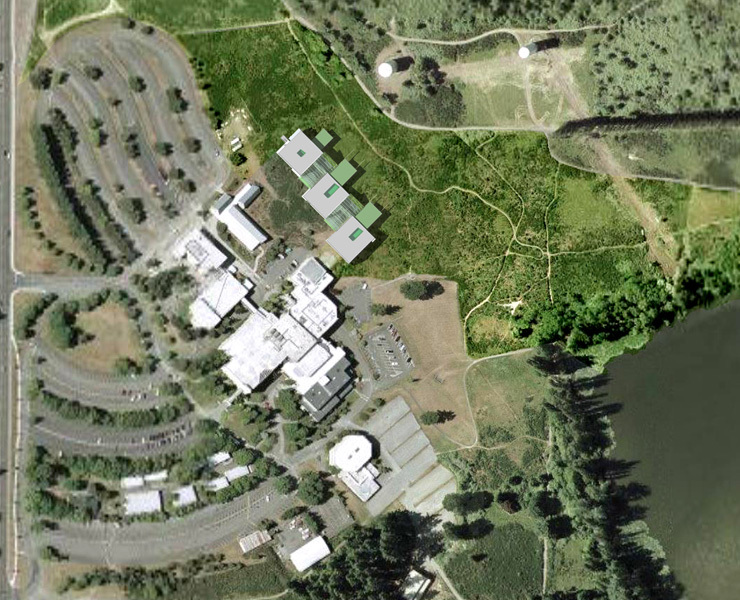 Green roofs over the faculty office blocks allow students to monitor water quality differential from the various roofs. 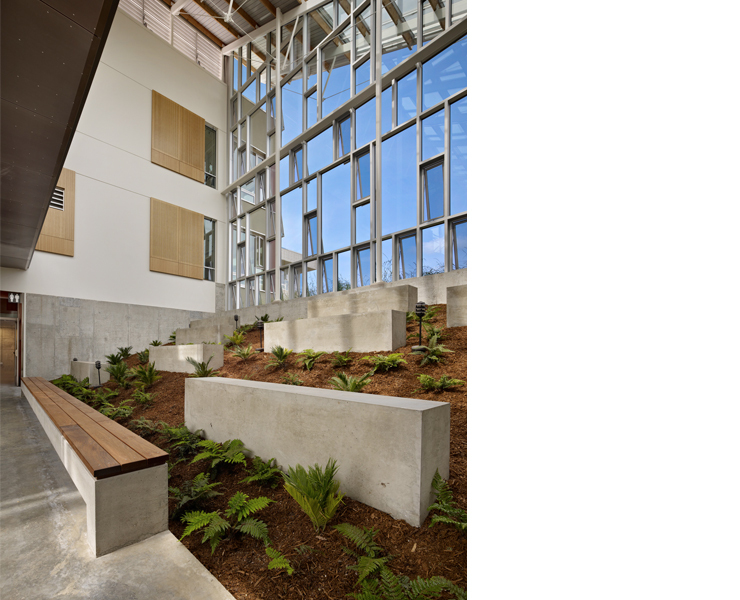 Each department is organized around a commons that feature biomimicry inspired furnishings, materials and graphics that become a learning tool to understand design in nature and its integration into our built environment.